Google’s Inbox app is getting a few new drops of machine learning. A new search experience is appearing for many users that categorizes some of the items you may want to find, such as frequent contacts, your accounts with various companies, and other categories that may better offer up what you’re looking for. The most useful function is with the airline companies that appeared in my Inbox, as I could tap them and see my membership number right away. Other options would pull up recent emails, which could be helpful for tracking down a previous bill. 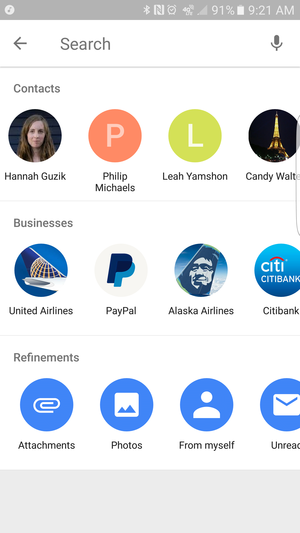 Inbox delivers with different contacts, businesses, and refinements for your search choices. There’s been no announcement from Google, and not all users are seeing the new interface, so this could be an A/B test. There’s no update required, so just fire up Inbox and touch the search icon at the top right of the screen and see what shows up. If this is your first foray with Inbox, check out some of our tips and tricks to get the most out of Google’s smart Gmail app. Why this matters: Inbox is the future of Gmail. Google sees it as a place to serve as a hub for not just messages, but reminders, web links, and important details about your online accounts. It’s a concept worth embracing, as long as you’re alright with one company storing a lot of information about you.